Flowtech 31106FLT Long Tube Headers Fits 63-82 Corvette. 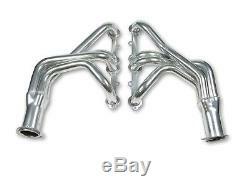 Long Tube Headers; 1.625 in. Collector; Mild Steel; Ceramic Coated. Collector Diameter: 3.000 in. Collector Tube Size: 3.000 in. Engine Make/Size: Chevy Small Block (262-400). Primary Tube Diameter: 1.625 in. Tube Diameter: 1.625 in. WARNING CA Proposition 65: Yes. Fuel Economy From The Engine. Leak Test For Max Performance. Flowtech headers are the perfect combination of performance and value. Flowtech long tube headers are precision engineered using mandrel bent tubing, formed collectors and 5/16 flanges with sealing rings for a leak-free seal. All mounting hardware and gaskets are included for a simple installation. This header is coated in a high heat and corrosion resistant metallic ceramic thermal coating that increases exhaust velocity and reduces underhood temps for increased performance. Flowtech Performance Exhaust was founded in 1994, by exhaust market expert Gary Biggs, with the mission of delivering high quality performance exhaust at a great value. The mission was successful and in less than two decades Flowtech became the leader in value priced exhaust systems. Flowtech cornered its place in the market with aggressive and memorable product names such as Raptor(TM), Terminator(TM), Afterburner(TM) and Warlock(TM). Flowtech even revived some names from back in the day like Purple Hornies(TM). Flowtech made its mark with simple yet effective improvements like slotted port flanges giving added wiggle room during header installation. They dimpled their tubes at the port to make more room for the header bolts and they parallel ground their flanges to assure a tight seal. Flowtech innovations include their unique Afterburner headers which separated the odd firing cylinders with a velocity tube to improve scavenging. Their patented Warlock bypass muffler won the SEMA best new product award for its revolutionary open or closed design in 1996. When Flowtech became part of Holley Performance Products in 1999, the company continued to focus on value, with an emphasis on late model cars and trucks. Headers and exhaust systems were developed for Mustangs, Camaros, and all types of full size trucks - including diesels. The same innovation continues today with the addition of universal X-pipe kits and X-pipe kits with built in cut-outs. Continuous product updates and improvements to manufacturing processes will keep Flowtech the leader in value priced exhaust systems. We hope you enjoy your Flowtech product as much as we enjoy building it! Starting from a small garage in the 50's to the beautiful new 6000sq ft showroom we have today, customer service has always been a top priority. We can only process Domestic credit cards. Which carrier is used depends on your location. We will choose the carrier that will deliver the quickest for your location. We can not and will not declare an item as a gift. We strive for accuracy, however, there could be discrepancies on the manufacturers end with listing applications. PLEASE MESSAGE US WITH ANY QUESTIONS OR CONCERNS ABOUT YEAR/MAKE/MODEL INFO IF YOU NEED! That said, we will assist in processing a claim. In either case, we will assist in the process. This listing is currently undergoing maintenance, we apologise for any inconvenience caused. The item "Flowtech 31106FLT Full Length Ceramic Headers Fits 63-82 Corvette" is in sale since Friday, January 30, 2015. This item is in the category "eBay Motors\Parts & Accessories\Car & Truck Parts\Exhaust\Exhaust Manifolds & Headers". The seller is "espeedshop" and is located in Lindenhurst, New York. This item can be shipped worldwide.